We recently picked up Scout as our new foster dog through Collie Rescue of Greater Illinois. 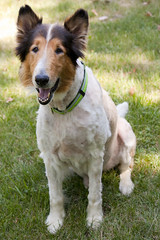 Scout is a purebred rough coat Collie that was rescued as a stray covered with over 80 ticks! Yuck! If that isn't a reminder to Frontline your dogs, I don't know what is! He had to be shaved down to make sure all the ticks were removed properly, but he doesn't mind. He's just thrilled to be living inside, loved and cared for again! Sadly, he did contract Lyme Disease from the ticks so he is beginning treatment. Scout is a handsome and well-behaved fella. He minds his manners and believes very strongly in getting along with everyone. It has been wonderful to see him make fast friends with our two dogs (Gerry and Fletcher) as well as our two other foster dogs (little Chihuahuas). He is a very sweet and gentle dog. Vote for your favorite collar for Alexander! We just took in a new foster dog named Alexander. He was rescued on a cruelty/neglect case and is in desperate need of some extra love and attention. While we give him lots of yummy food and warm cuddles, we need your help picking his new collar. It's down to the vibrant American Flag collar or the funky Punk Rock Dots collar! Embrace springtime with one of our happy flower-filled dog collars and leashes. Choose from any of our delightful colors: pink, purple or yellow! Zack was dropped off at an animal control after his family said they lost their house and could no longer care for him. Poor guy has been a wreck since losing the only family he ever knew and has been very sad and mournfully howls when we have to leave him at home alone. We took Zack in as a foster dog and he has been enjoying his new friends (the Pink Puppy spokesdogs, Gerry and Fletcher), but he still hasn't settled in 100% and longs for a new forever family to call his own. 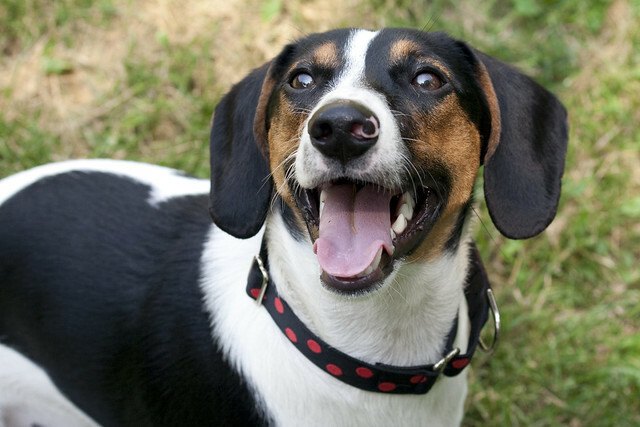 Shortly after arriving here, Zack picked out his new martingale collar and is very pleased with his choice. He picked the Red Hearts Buckle Martingale Dog Collar. He loves showing it off to people he meets and hope a new family sees how cute he looks and falls in love with him. 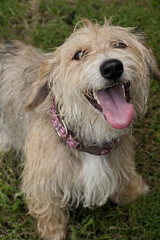 Macy is a 2 year old hound/terrier mix (some thought she might be part PBGV). She was picked up by animal control as a stray (no collar, microchip or any other ID) and, of course, no one claimed her. I took her in as a foster and she picked out a new Vintage Pink Martingale Collar (with a buckle) complete with ID tag and was later microchipped for safe keeping. I meant to post her online last week, but before I had a chance she was adopted! So, congratulations little Macy. 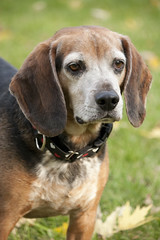 We wish you all the best in your new forever home and know you will never be a forgotten "stray" again. 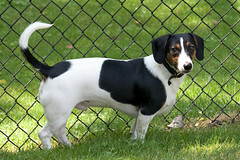 Ronnie was original bought by a family and was supposed to be for their children. After a few months the parents brought Ronnie to the shelter because the kids weren't taking care of him and the parents didn't want to be responsible for his care. It's a shame Ronnie had to find such crummy family to spend his first few months with, but he's ready to find a new one that will love him for the rest of his life. Let them show it off by sporting our vibrant American Flag collar and leash or a red, white and blue Nautical collar and leash! Need it for the 4th of July? Order by this Saturday (6/26) with Priority Mail shipping! After our last foster dogs were adopted we have been foster-less... for nearly a week, oh no! 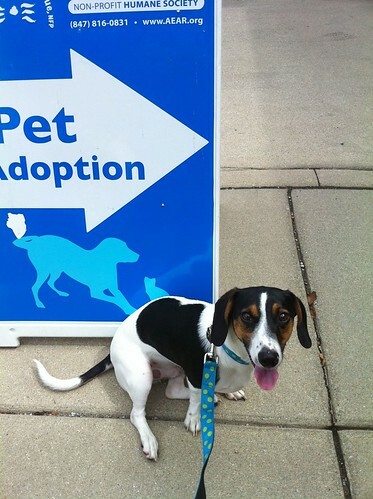 Well, we just received news of a 7month old Beagle/Dachshund mix named Ronnie who needs a place to stay until he can find a family of his own. Check back on our blog for an update on little Ronnie. Hmm... I wonder which collar he would like to wear? Post your suggestion in the comments below! My newest foster came to me completely traumatized. He had just been given up by his owner and had little to no socialization with people other than his owners. The poor guy was given up by his family because they were going through a divorce and said they no longer had time for him. He doesn't understand why they won't come back for him. When I first took him in, Kramer was so terrified that he wouldn't let me touch him. He would give me the "Evil Eye" and even snap to scare me away if my hand came too close. It took many hours of quietly sitting with him, using slip leashes to get him out of his crate and out to go potty and only feeding him if he ate it from my hand (which he did begrudgingly). However, after a week he had transformed and we finally developed a strong level of trust with each other. Congratulations! 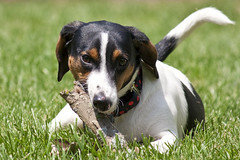 Now that you've seen Junior's photo, you have officially seen just about the cutest thing EVER! Take a minute to recover, because this was a once-in-a-lifetime moment. Strange things happen when you see a puppy for the first time. Your eyebrows wrinkle together & upwards, a big smile stretches across your face, your shoulders go down and your hands stretch out. An involuntary 'Ohhhhh! Look at the baby!' raises up from your heart and escapes your lips and your can't wait to pick that little bundle up and snorgle her neck. Lexi is a puppy who carries a Level 10 Cuteness Alert - so be prepared for all of the above when you see her. We'll even warn you about the possibility of a Level 11 knee-melt and maybe even a Level 12 Cuddle Attack - this is one little girl who will wiggle her way straight into your arms and your heart. Now, Lexi is NOT a fluffy ball of fur, and never will be. 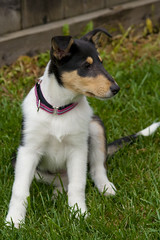 She is a smooth collie, and is one of the prettiest we've ever seen. 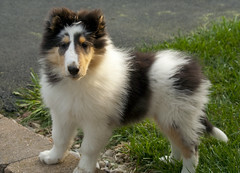 She is an elegant little girl who will blossom into a sleek, lovely aristocrat of the collie world. Smoothies have beautiful movement, are very smart and extremely affectionate - and people who have them are often hooked for life! Add the fact that her lovely tri-coat will gleam like ebony and require much less maintenance than a rough, and well, what more could you ask? Lexi's days are busy doing puppy stuff - playing with toys, learning about housebreaking, and walking on a leash, so your summer will be filled with fun as you guide her through her growing months. Every day will be exciting as you watch her grow and learn, and she will have a special place in your heart forever - puppies are like that! We strongly recommend that Lexi attend Puppy School when she is old enough - not only for the bonding it will produce between you, or the education she needs to be a canine good citizen, but because Lexi is blind in one eye. Lexi's left retina was detached at birth, so she doesn't know any other way to see, but training class will help her be confident of your guidance, and help her learn to move freely through life. Lexi's right eye is normal, and you'd have to watch closely to notice that she sees from only one eye, but you should be aware that sometimes she might be surprised by movements on her left. 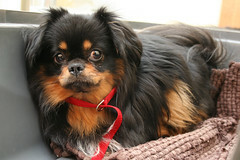 Puppies are always little jewels in the Collie Rescue treasure chest, and Lexi is certainly one of our sparkling best. A bundle of darling in the beginning, and an elegant lady to share your life - we envy the family who adopts our little Lexi - will it be you?